There are many techniques and types of keyword research that can each play a different or complimentary role in the ongoing endeavour to find new valuable keyword. We cover a range of common techniques for performing keyword research in this and other guides in this series. This guide looks at the competitor gap analysis process for identifying new keywords. You will to use a web crawler like Raptor to conduct this research, again there may be variations and tweaks that could change this, but the overarching process should stay broadly the same. The first step to come up with either a single competitor or a range of them to analyse, in this process we have chosen to show how to analyse one, but adding to this is not difficult. Choosing a competitor will likely depend on your current state of affairs, your business goals and resources… As we are looking for new keywords or opportunities in our competitor analysis, we typically want to look at a competitor that is performing a little better than us. Not, different league better, as we don’t want to be looking at keywords we have no chance of ranking for, at least not first. If you already know who your competitors are, simply choose one and crack on! If you are unsure, consider looking at the sites that sit above yours in the SERPs (Search Engine Result Pages) for your head terms. Understanding who your competitors are is a major part of this and should not be seen as a trivial matter… Like most processes, if you put garbage in, you get garbage out. If you’re not an SEO, what you think is a competitor might not be… If you’re in a 3-person start-up comparing and brokering loans, in your first year with moderate investment; Compare the Market are not your competitor! An online competitor is a site that you vi for traffic against, who ranks near you for the same or similar keywords. You can use Raptor for this, or any decent web crawler, just ensure that you are able to pull out all o the data you need (see next step for a list of components to check). They might use hyphens or commas instead of pipes, and there might be one or four keywords in there. In any case, you can use a text to columns function in Excel to split these out; from there it’s easy enough to delete the separators, spaces and brand names… What you are left with are the keywords. You can also compare text strings between H1 headers and Page Titles to derive target keywords, typically the principle keyword will appear within both of these fields. You will need to refine this list pages like ‘contact us’ or legal disclaimers are unlikely to be optimised for keywords, more often the page title reflects the page content. Filter out any junk from this list manually. Alt tag text is also another good indicator of secondary keywords, so review this separately. If you use an SEO tool like Raptor, we can help determine target keywords for you. At this point you can compare this list to your own site’s target keywords; initially its fine to just match up and stop anything missing from your list that’s on theirs. However, this process requires a little more nuance than that; we’re not just grabbing keywords, we are aiming to compare the lists to spot fundamental differences. What are you targeting that they are not? What do they target that you do not? What is their top keyword? Start to build lists of keywords that fall into these categories or label them accordingly for filtering and analysis later. Start to build lists of keywords that fall into these categories or label them accordingly for filtering and analysis later. At this point you should start be seeing a more comprehensive picture than just an unsorted list of keywords. This is optional, but you can also pull in data from a number of areas to help with this analysis. When combined with the categories and labels; you can segment this data by those labels to get a picture of how well you and your competitor rank. This is always useful to know, as you can easily filter keywords that you currently rank well for from the list. It can also provide an indication of the work required to advance your listing to a valuable position. This can provide a good indication of the potential value of the keywords that you have identified, compare this to what the competitor’s top keywords are to see how they correlate. 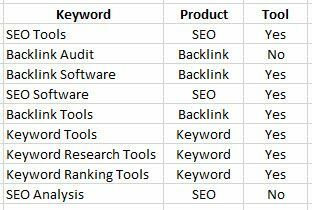 Some SEO Tools have created their own metrics that look at how competitive a keyword is in terms of how hard it is to rank for that keyword. Moz for example have the Keyword Difficulty score, which is much more useful than Google’s own ‘competition’ metric. Using all of the data and analysis that you’ve gathered up until this point, you should be able to identify keywords and groups of keywords, patterns and entirely new avenues of thought. There is no magic formula to this, you will need to review the data with your objectives in mind to determine what, if any keywords should be targeted and how. Once you’ve been through this process, you can either perform it on another competitor or expand the analysis out to a wider set of competitors at the same time.